The installation of a new roofing system over an existing roofing system is, if viable, an alternative approach to a full flat roof replacement. 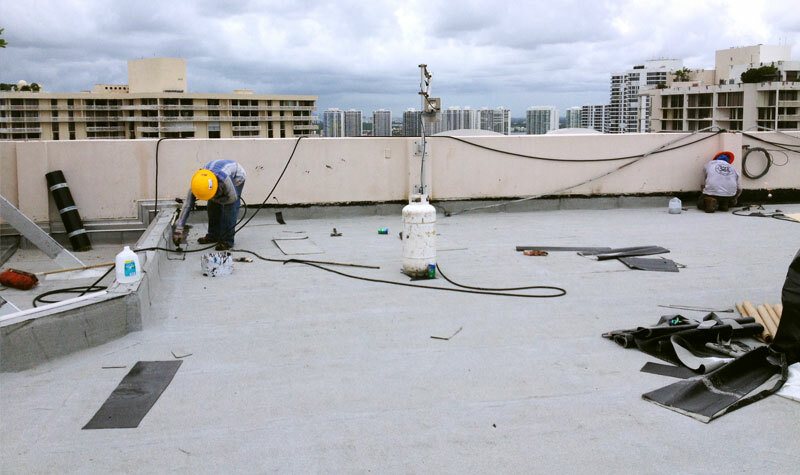 The major advantage of this process, known as a flat roof recovery or re-roof, is the cost savings associated with not having to remove and dispose of the existing flat roof membrane. It is interesting to note that the cost of disposal to landfills, labour, and trucking costs are high and climbing faster than material costs. Flat roof recoveries are generally completed in a faster time frame and are less intrusive than a complete replacement. A flat roof recovery provides less risk to the owner because the roof isn’t opened up during the process. With the existing membrane staying in place, it actively protects the interior from weather and damage while the new roofing system is being installed. This is especially true if the facility houses sensitive materials or equipment. Warehouses and material storage are generally less sensitive to moisture damage, but if you have a data center or telecom system, the tolerance for leaks or debris is zero. For this reason alone, facility executives at data center facilities can make a good argument for recovering the roof unless a tear-off is absolutely necessary. Flat roofing membranes such as SBS Roofing Systems and PVC Roofing Systems permit the re-use of the insulation and other components including the waterproofing membrane themselves. The materials beneath the roofing membrane including the insulation and cover board as well as the quality of workmanship during the initial installation process are determining factors on how long the roof can last and how much of the material can be reused for a flat roof recovery. The amount of materials going to a landfill during a flat roof recovery is much less than tearing off the entire roof. Continuing to use existing insulation and replacing only what’s needed creates less manufacturing waste than if the insulation was replaced. Most modern building codes allow a maximum of two non-ballasted roofing systems on a structure, mostly due to the weight associated with the roofing materials. Beyond this limit, a flat roof replacement must be completed. Flat roof replacements do give an organization a chance to be more sustainable. Installing an entirely new flat roofing system allows for more insulation to be put on, saving energy on heating and cooling the facility. Facility executives can go one step further and install green or reflective cool roofs for more energy savings. And because the service life of a brand new roof may be longer than a recover job, that may mean less materials go to the landfill in the long term. Contact us today for a free estimate on your next flat roofing project. Call 416-855-0549.